The psychiatric emergency room, a fast-paced combat zone with pressure to match, thrusts its medical providers into the outland of human experience where they must respond rapidly and decisively in spite of uncertainty and, very often, danger. In this lively first-person narrative, Paul R. Linde takes readers behind the scenes at an urban psychiatric emergency room, with all its chaos and pathos, where we witness mental health professionals doing their best to alleviate suffering and repair shattered lives. 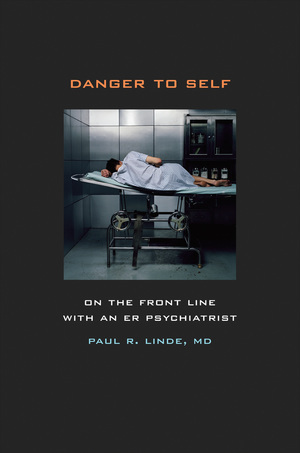 As he and his colleagues encounter patients who are hallucinating, drunk, catatonic, aggressive, suicidal, high on drugs, paranoid, and physically sick, Linde examines the many ethical, legal, moral, and medical issues that confront today's psychiatric providers. He describes a profession under siege from the outside—health insurance companies, the pharmaceutical industry, government regulators, and even “patients' rights” advocates—and from the inside—biomedical and academic psychiatrists who have forgotten to care for the patient and have instead become checklist-marking pill-peddlers. While lifting the veil on a crucial area of psychiatry that is as real as it gets, Danger to Self also injects a healthy dose of compassion into the practice of medicine and psychiatry. Paul R. Linde, MD, is Clinical Professor of Psychiatry in the School of Medicine, University of California, San Francisco and the author of Of Spirits and Madness: An American Psychiatrist in Africa. 1. The ER Doc: Who's Calling the Shots? 7. The Clairvoyant: Whose Life Is It Anyway?